We feel great pride in bearing the name of the Rebecca Motte Chapter of the National Society Daughters of the American Revolution. 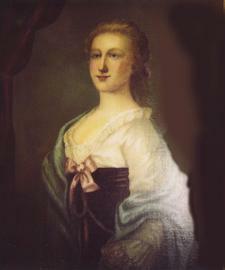 Rebecca, daughter of Robert Brewton and his wife, Mrs. Mary Loughton, nee Griffith, was born in Charlestown, June 15, 1737. At twenty-one she married a townsman, Jacob Motte, and thereafter divided her time between Charlestown and his plantation on the Congaree River. "During the troubled years preceding the American Revolution, she developed a keen and intelligent interest in the problems of the Colony, and worked with a will towards relieving hardships attendant upon the political unrest. She brought her entire plantation force down to the city to work upon defenses that were being constructed on its land side. When war was declared, Rebecca threw all her energies and her means into war work, ministering to the needs of both soldiers and civilians. Shortly after this time, through the death of her half-brother, she inherited her grandfather’s home, the Miles Brewton house, No. 27 King Street. Following Jacob Motte’s death, and the occupation of Charlestown by the British, this home was chosen as headquarters by the English officers. Here Rebecca was called upon to fill a role that demanded unbounded poise. Restraining her personal feelings, though surrounded and sometimes insulted by the enemies of her country, she presided at her table day after day with calm dignity, yet in such manner that these invaders of home and country never doubted her patriotism. Her marvelous poise was again shown later in the war when the British captured her plantation home on the Congaree, where she was living at the time. They threw up fortifications around the house, using the place as a military supply station, hence the later name, Fort Motte. The American forces under Marion and Lee advanced to the siege of the station. It was found necessary to set fire to the home in order to re-capture it. When Rebecca, who had moved to a smaller plantation house near-by, was informed of this decision, she acted with characteristic spirit - “Do not hesitate a moment,” she replied. “I shall give you something to facilitate the destruction” - and she brought out three East Indian fire arrows, a gift to her father in happier days. These arrows were fired from a musket; two of them failed of their mission, but the third one hit its mark and set fire to the roof of the house. As a result of the war, her estate became heavily encumbered with debt, but was retrieved through her character and administrative ability." Laurie. "Rebecca Motte (1737-1815) - Find a Grave Memorial." Find a Grave. Jan 04, 2007. Web. Retrieved 7 Jun 2012 from http://www.findagrave.com/cgi-bin/fg.cgi?page=gr&GRid=17297012.